Coloplast Self-Cath Straight Tip Catheter from HealthyKin.com is 100% latex-free and offers patients a variety of options for intermittent self-catheterization. Each catheter is made with the highest quality standards dedicated to patient comfort and ease of use. The fire polished eyelets and siliconized surface allow for smooth insertion. 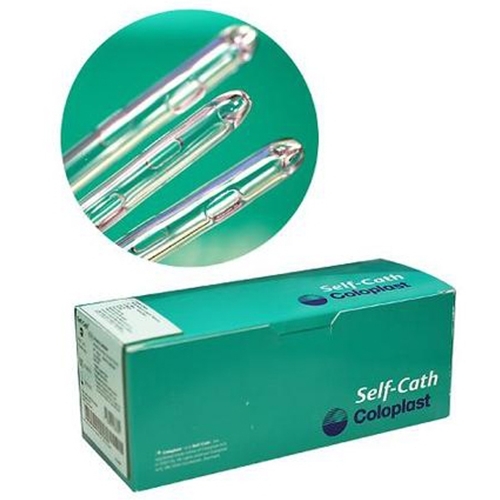 Self-Cath intermittent catheters are available in a wide variety of sizes and styles. The best company for cath supplies. Easy to work with, online ordering a breeze each time, and supplies are at my door in 4-5 days. Awesome service. Have told my urologist and nurses about healthykin for all their clients for best rates and quality service and products. Fast delivery and good prices. No complaints. I get next day service usually EVERY time I order catheters. The price and the quick delivery is great! Always a speedy delivery! Product is exactly what I ordered. I've used them a few times now and will continue to order from them. Arrived quickly. Easy to use. Pleasant first experience. Great to deal with! Easy online ordering, fast delivery and reasonably priced. I am very happy with the products. Great service, easy no hassle ordering & really fast delivery! I will use them again! Healthykin.com is very good to work with. Colopast Self Cath is a great product but the cost has gone up and for someone that uses these several times a day it gets expensive.